1) Having too big of a population/tank size to allow for natural breeding/raising of young. I have always approached Fish keeping from a natural standpoint, trying to mimic what nature does the best I can. Since the day I began I would keep community fish and aggressive fish in the same tank. Provide the right type of cover, enough room, and make sure your community fish are quick, and you are all good (loosing 1 or 2 a month). Having 30 neons in 29gal with an oscar... wouldn't work. 2) Having too big of a bio-load and other chemical/environmental dependencies. Too much oxygen use, too much ammonia, too much poop for the filter, etc... This is what I believe most people would consider "Over-stocking". The number of fish associate with this can be increased with additional labor and maintenance. Also somewhat tying back to #1... aesthetic appeal and natural behaviors go away when a tank has too much commotion. I've noticed that if you have too many fish per sq inch... even the most notorious schooling fish will opt out of this behavior. Something to think about. I'd have to respectfully disagree with the above post by MikeP. I overstock heavily (you don't even want to know), and believe it or not, natural behaviors and aesthetic appeal (IMO, the more active, peaceful, coexisting life, the more Utopian it looks) increase. I find it to be true from there being no aggression among the fish in the slightest, no lethargy and many of the fish species even spawning on a regular basis. And yep, my schooling fish would still school regularly, and not out of stress. Everyone is active and their colors are bright as can be (though when I switched over to a heavily planted tank, that changed fish behavior, which is another long story I have talked on a few times in the past). I do observe fish behavior quite heavily and can definitely tell if fish are in distress, and none of my fish are stressed in the slightest, even though there is a ton of fish. Can't say I'd recommend an overstocked tank to any average fish keeper though, as overstocked tanks do require a well versed aquarist to keep them successfully long-term. In regards to MikeP's definition #1, I'd also have to not agree with that type of set up. Well, at least to a degree. I am all for nature, but the average hobbyist would not have, what I would consider, a large enough tank to appropriately house prey with predators (or community fish with aggressive fish), in the same tank. Even with plenty of plant cover/places to hide, it's just not a nice environment for the "prey" to live in constant fear/stress of predators in close proximity (in comparison to nature, where there is usually a lot more room to be safer away from predators). In a really large tank (how large depends on the size of fish and how the tank is furnished), this could be done, in what I may consider acceptable (if the "prey" have more a of a fighting chance to survive/get away and have more area to feel safer in, not having to constantly remain hidden or run away most of it's life to survive each day). I have had this overstocked setup for about 3 months without any issues, just a persistent and consistent maintenance schedule for sure. Oh, just wanted to clarify that I only overstock/stock fish in tanks able to properly accommodate the size and activity needs of the fish. I don't put fish in tanks that don't have the dimensions for the fish to move around/grow/live in appropriately. Overstocking and "improperly" housing (tank dimensions too small for kept fish) are two different things. Excuse the off topic comment... Noooice Daemons! Not a fish I see being kept a whole lot. Do you have them in low ph? They would make it into my HEAVILY STOCKED dream tank along with Brasiliensis, Red Shoulder Severums and (True) Parrot Cichlids. I miss my big cichlid 125. On the subject, I agree with those that say that it is possible to overstock, but the fish can thrive with a diligent maintenance schedule. My 72 is 100% stocked and all the fish are living happily together. The flipside is a heavily stocked tank can crash and burn very quickly with just a few weeks of missed maintenance. Stocking fish is just like planting a tank. Adjust it to your lifestyle. A diligent homebody can keep a heavily planted/ stocked tank no problem. A person who is out and about most of the time may have trouble with that set up. That pic must be from one of the major aquarium companies. They always show pics of way overstocked tanks which of course is misleading to newbies entering the hobby. How do you gauge stocking levels. If filtration and accompanying bacs are at optimum levels would 25 diamonds in a 40 gal planted be overstocked? I'm just not sure how to gauge stocking to be honest. Thanks!! I got the Daemons from Jeff Rapps, he has an amazing fish stock of south American cichlids. my PH sits at 6.0 and have been using some Fluval plant stratum and some Tantora Catappa Bark to release some natural tannins to keep my PH stable. I 100% agree with you though, Satanoperca are by far my favorite eartheater species and I hope to keep some others in the future. I would challenge this and say that maybe what you are observing is "cool" behavior... but might not necessarily be "natural" behavior. Your fish might be healthy and happy... no doubt... but there arent too many streams out there that have fish bumping into each other's noses (overstocked) without a concern in the world of a predator. I would also like to challenge how many fry end up surviving in the "over crowded" tank? Because "Over crowded" and "natural" are two different things. Mother Nature does a good job at making sure that is the case. If nature is too overcrowded and fry cannot survive... it slowly gets... uhmm.... less crowded until there is a natural balance again. Really need an answer to this. As basic as it seems I've never actually been able to work this out and wether or not the variables change depending on how heavily planted your tank is. Back to some of the above points for clarification. ... Overstocked in what sense? That everything survives? In the sense of planted tank. Most if not all of the tank will be planted and I have adequate filtration but I notice that a lot of planted tanks have very few fish and I've never really understood why. Would 25 green neons or 25 diamonds be overstocked in a heavily planted 40g single species tank. Or is there some rule that I haven't stumbled across when it comes to a planted tank stocking, that allows you to work out how much of a particular species I can stock in planted setups. 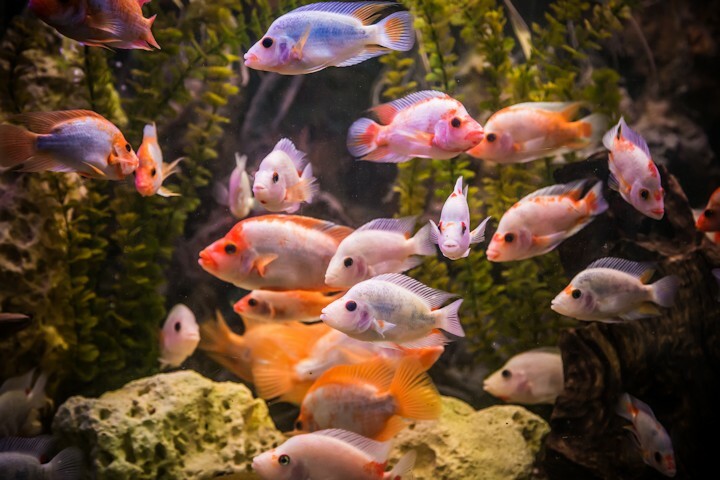 The more fish one has,the more they tend to feed,= more waste in the tank from poop. Plant's will take up most of the waste (nitrates) as well as ammonia but one can still have more organic input than they maybe want or can remove between weekly water changes. If you are one who want's to keep nitrates at say 20 ppm, and by week's end you have 80 ppm ,then you are prolly over feeding,over stocked,under filtered ,or all of the above. 2) the fish are hiding and making more use of the plants?